A vampiress is bound to look her best when she wears Victorian styles, and that goes equally well with Neo-Victorian outfits. That is why this Steampunk Vampiress Women's Costume looks so great, as it fuses two great concepts. 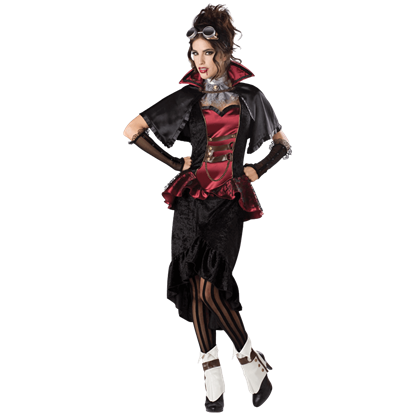 This Steampunk Vicky Womens Costume is a complete look that will take you from mundane to Steampunk in only four pieces. This costume is elegant and beautiful, making it perfect for a woman with adventure in mind. Done entirely in black, this costume is the ideal blend of gothic beauty and neo-Victorian style. Not only is the Steampunk Victorian Lady Costume absolutely gorgeous, but it is the perfect look for a woman seeking style and adventure!